Dated calendars are the staple planning tool in my book. Everyone needs a dated monthly calendar at the very least, so they can keep track of appointments, upcoming events and have a general overview of what is happening in their life each month. They can help make sure you don’t over-schedule yourself and are fantastic for planning family activities. The year at glance dated pages make blocking out vacation time and other long-term planning a cinch! Every year I have a lot of fun creating new dated calendar for all of you. I hope you enjoy them! Be sure to stop back in the spring when I’ll be uploading next year’s calendars!!! The academic calendars for the 2019-2020 school year start with July 2019 and end with June 2020. You have your choice of full or half-size as well as a Sunday or Monday start day. Whether you’re getting a jump start on planning for the new school year or just prefer using an academic calendar for your planning needs, you’re sure to find an option that will fit your needs. 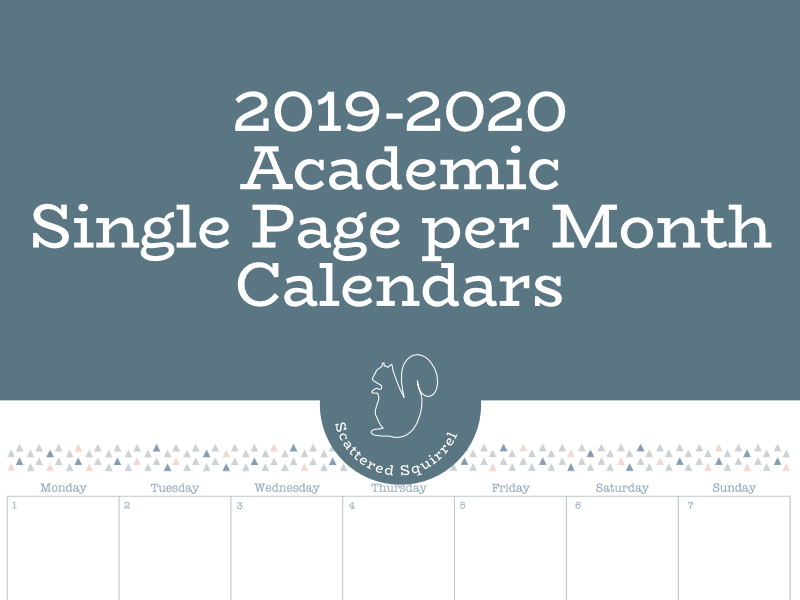 You’ll find all four versions of the single page monthly academic calendars in this post here. The two pages per month academic calendars are coming soon! The 2019-2020 academic year on a page calendars are great for highlighting school holidays, exams, days off, sports events and so much more. 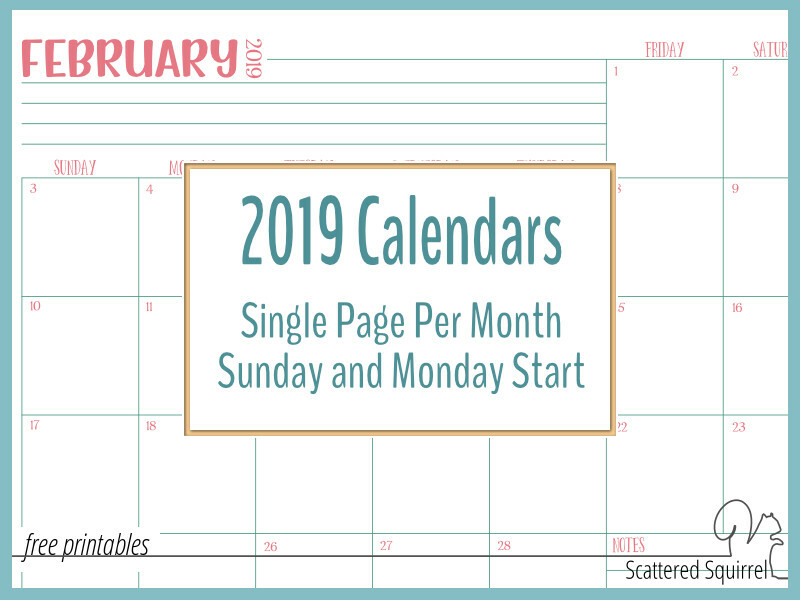 Both the full and half-size versions of the single page per month dated 2019 calendars can be found below. In addition to the two different sizes, you also have your choice between a Sunday or a Monday start calendar. 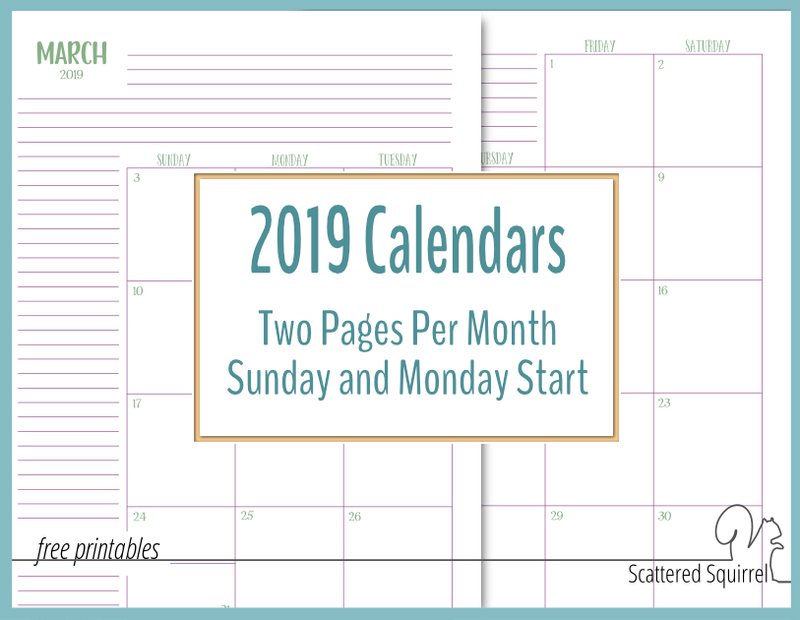 Just like the single page ones, you’ll find both the full and half-size versions of the two pages per month 2019 calendars in the post below. Choose the size you need and also choose whether you’d like a Sunday or Monday start to your months. 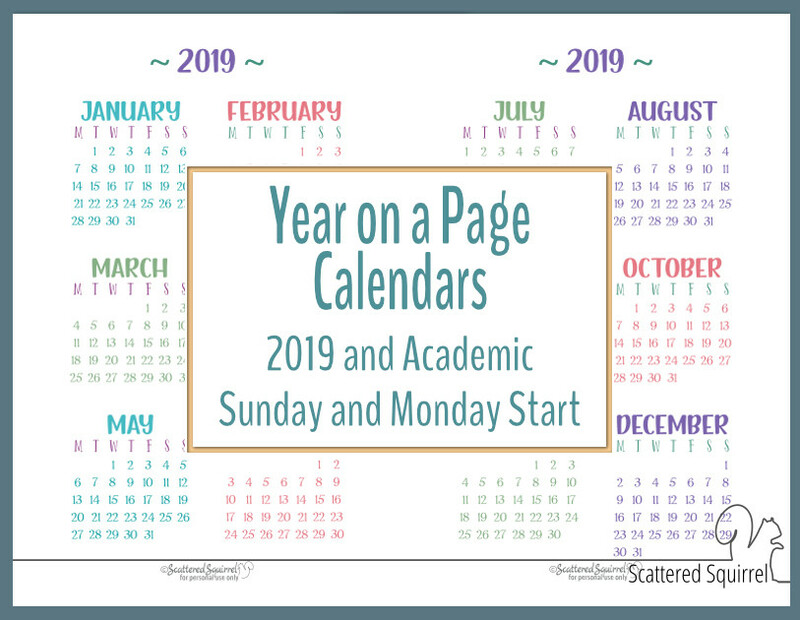 This post contains both the 2019 Year on a Page Calendar printables and the 2018/19 Academic ones. I have been playing with page layouts for a few months now, and I think I’m getting to closer to finding one that will work and not be too hard to explain how to set the printer settings and then after printing, how to assemble. Hopefully I’ll have it figured out by the time I start working on the 2016 ones. Thank you so much for giving me some suggestions. I’m going to use your advice and play around and see what I can come up with. Thanks so much for taking the time to share. Another set of eyes is always a good thing in my book. These are awesome calendars. Thank you for offering them for free! 2) Would you consider offering a black-and-white version for those of us with boring printers? The colors are beautiful online but when I print them out in grayscale it just looks faded. Thank you so much for your feed back. I am working on new printer friendly and user friendly versions of the half-size two page calendars. I’m not sure what it will look like yet, but I am working on it. And yes, I am looking into changing the colours. I’ll either be offering a black and white version, or I’ll be using darker colours that print out in black and white much better. I just printed 2015 two page but would love the 2016 since I am a teacher and plan from Sept 2015 to June 2016. Thanks and I love your site. Thank you so very much for your beautiful calendars. I have always used monthly 2 page full sized calendars and now I can print beautiful ones from my computer. I began using the ARC system last fall and have been wondering what to do until the Academic Year ARC calendars are released. Now, I do not have to wait. Your calendars are beautiful and you are so gracious to provide them for free! I am thankful that I found your website! I am so happy that you found the printables helpful! 🙂 There is nothing worse than having to wait for something hit the shelves. Enjoy!!! Oh Terri, you are a genius! Would you mind if I borrowed that idea for the 2016 calendars? I would give you total credit for the idea in the blog post!! That would certainly solve the issue with printing double sided for the 2 page per month half-size ones. I just found your 2015 half single page calendars and I love them! They work great to add into my planner than was lacking a monthly view. Do you have a time frame when the 2016 half single page calendars might be available? Hi Allie, I love your website, thank you so much . Been a great help to my family and I ( family of 8) . Keep up the great work. I’m happy to hear that Olive! 🙂 Thank you so much for your sweet comment. Hey FYI the august 2015 calendar has incorrect numbering. The number 9 appears twice. I will not be making the 2016 calendar in the 2015 design. I know it’s tough when the pages don’t match in design, but I like to change things up each year, and it’s a lot of work to change them all. I will be sharing new planner printable that match the 2016 ones later on this year, and I do have blank calendars in that style that can be used. Or, if you really want it to be dated, you can hop on over to my customized printable page and send in an order for one. HI Alli, I am loving your calendars especially the 2 month per page 2015 calendar. Is there a way to make this for the 2016 calendar year? This view is so helpful in planning my homeschool year. There are two 2016 2 page per month calendars, one full-size and one half-size. They’re linked up above. I don’t have any plans to make the 2016 dated calendar in the same colour scheme as the 2015, but I do have those same layouts in blank version if that helps? Hi, Thanks so much for posting these. Super CUTE!!!! For some reason the 2016 half size calendar is the same content as the full size one. 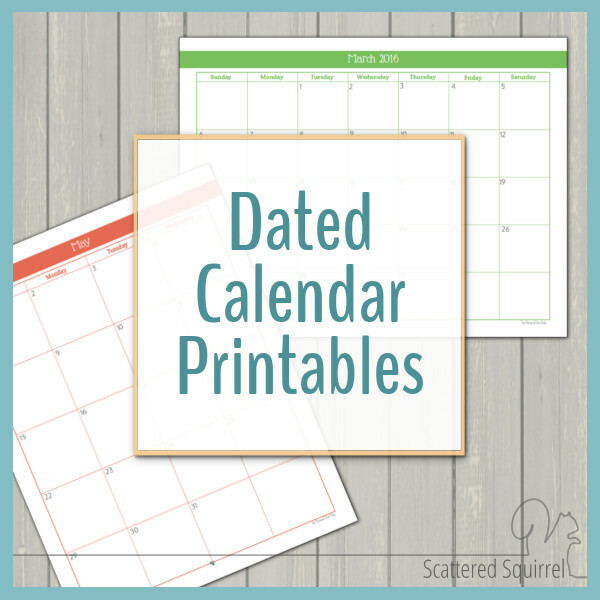 I downloaded this file https://scatteredsquirrel.com/wp-content/uploads/2015/05/2016-2-Page-Per-Month-Half-size-Calendar.pdf and it is 24 pages, not 12 like the 2015 one. Hi Becky, I just shared a new version of that one and I’m so glad you took the time to leave me a comment about it because I forgot to add it to this gallery. If you would like to check out the new version (set up just like 2015’s but with 2016 colours and layout) you can find it in this post – https://scatteredsquirrel.com/2015/08/printable-updates-as-requested-by-you/ . Hi Alli! I absolutely love your blog and all of your calendars. Thank you so much for sharing these with all of us. I’ve been trying to print out the 2016 single page, half-size calendars and I’m not having any luck. It opens up in Adobe and it’s printing a full size sheet and there are 12 pages. I just printed out the 2015 version and it went smoothly. Any idea what’s happening? Yeah the half-size files are a little tricky to print. You have to either cut your paper in half or change the settings in the print box to say fit two per page. I’m working on putting the single page ones back the way they were for 2015. I’ll be sharing those as soon as I get them done. Thank you Alli! I’ll wait until you’ve changed them back. I can’t find anywhere within my print set-up to change it to print 2 per page. It’s printing 1 month per page. hi! Just found your site and love your printables. I know people were asking about printing the half pages back to back and I’m guessing that’s why the 2016 half page- 2 pages per month calendar pages are different than your 2015 pages. I love the 2015 pages because I can cut them in half and put them in my class planning binder for my class so I can see the whole month. Is there a way to print the 2016 calendar that way so I’m not wasting a lot of cardstock. Thanks for your help and the wonderful website! The Blog says the calendars are free to print as long as it is for personal use. I’ve been trying to print the 2016 two page per month calendar for two days now and no luck. Did I misunderstand the “free” part? I can print the 2015 version. It downloaded etc. but won’t print. Any ideas? HI Tommie, I’m so sorry to hear about your troubles. You certainly did not misunderstand the free part. I have no idea why it won’t print for you, how frustrating. Maybe try downloading the file again and see if that helps? If that doesn’t work feel free to send me an email (address is on my contact page) and I’ll try sending you the PDFs, maybe that will help. Again I’m so sorry to hear about your troubles. Hi Alli, I just want to thank you for making these calendars available for free. I really appreciate it. I just purchased an ARC personal planner from Staples yesterday and needed monthly calendars for the rest of 2015. I found your website and was able to download and print the necessary pages. They look great in my new planner. Thanks so much! You are most welcome Susie. I’m happy that the calendars were here to help. I love my Arc books, I’m up to four now, lol I’m slowly replacing the binders that I use on a regular basis with them because I find them so much easier to use for active work. I hope you enjoy yours. I think some of your “fans” need to have some instructions on which print option to use with Adobe Reader. I used “Booklet” and it prints on both sides of the paper. If that doesn’t work for me, then I use “Half Sheet”. Just print one page at first to see which works for you. Not sure if you are aware of it or not, but when trying to print the full size two page calendar for 2016, the dates go all wonky. Dates such as “48” or a “0” where the “8” should be. Am I doing something wrong? Otherwise love all the printables. They are great and a tremendous time saver. Again, thank you. Rene’e. I love your 2-page monthly calendars! This will be my second year using them. They are perfect for me! I just noticed that there is no 31 December 2016, though. Is that a fixable problem? Can any of these calendars be cut to use on the coaster calendars that are so popular? Thanks for sharing these. I’m not sure Linda. I didn’t really design with any other purpose in mind other than printing them and using them in planners. I just wanted to show some love to you. I stumbled a crossed your site at the end of last year (2014). I have been hooked since, using your free printables all throughout this year. I love how you have so many choices on something as simple as a calendar(half page full, full page, half,etc). You make planning life very simple and easy. You do not over complicate things like a lot of organizing people do. I take your FREE (free can’t believe that alone) printables in a nice planner binder and I know everything I need to know ready for the entire year!!! NO surprises!! I hopped on today because my dog decided to rip up my November page and I see the 2016 is up. I bet you can not guess what I am going to be doing today???? I’ll just tell you, i am setting up my 2016 with your AMAZINGLY SIMPLE AWESOME FREE Planner Printables!!! It seems that somehow my last comment was lost. I love your calendars and this is my second year using them. They are perfect for me! On the 2016 half-size, 2 pager per month calendars, December 31st is not labeled. Is this a fixable problem? Thank you for the beautiful calendars! I’m running very behind with replying to comments. I have read them all though. I have that fix noted on my to do list and I’ll be getting to it as soon as I can. Thank you so much for pointing it out to me. I went over them all very carefully, but it never fails that I miss something on at least one of them, so I greatly appreciate the heads up! Am I not looking at something correctly on the 2016 full page two pages per month calendar— January looks backwards? Hi, I’m trying to get my day timmer and day runner to work with me. I have the portable size. 3 3/4″ x 6 3/4″ size for both of them. they also have 3 rings up top and 3 rings at the bottom. I need a weekly calendar similar to your: file:///C:/Users/Patron/Downloads/Calander%20weekly.pdf I need the following changes (1) sat & sun can share the column – sat on top Sunday halfway down to the bottom. (2) I need quarter hour increments to stay organized. My eyes will not focus on a horizontal weekly calendar. I don’t know how to do this on the computer. Just want to thank you for all the free printables and your generosity. I appreciate it so much. Your printables are beautiful! thank you for the simplicity of your designs! i am new to getting a life- planner together, so i’m excited to get started using your printables to figure out what works for me. it’s possible i am overlooking it, but do you have a full page or 2-page monthly calendar that has lines in each day? Thank you for leaving such a nice comment. I do not have a calendar with lined days yet. I’m working on them as time allows. Stay tuned though, I have a massive Reader Request post coming up in mid December and lined version of all all the blank calendars will be in that. At this point I don’t have time to do all the dated ones as well, but I’m hoping to incorporate that into all new ones going forward. I am trying to print off the half sized 2016 calendar and it prints half of the calendar but blown up on a full 8 1/2 x 11 sheet. I am so sorry, this has been an ongoing issues with these ones. If you head over to the blog page (Blog Tab on the top menu bar) one of my most recent posts has the updated versions of the half-size calendar and they should print like normal. Again, I’m so sorry for the trouble. I just found your website today – and I wanted to say “THANK YOU!” for all of your hard work and attempts to stay organized while keeping others organized as well. I personally do not have a website, but I have put together a two-page per month calendar earler in the year for 2016, but I am having hard time getting my lines to be straight (I made it on microsoft word). Do you have any suggestions? I totally love your two-page per month calendar, and I have been thinking about printing it and using it for work (I am a teacher), but I don’t want to use all of the colored ink for it, though I do love the different colors you incorporated with each month (super cute!). I am thinking about just sticking with my colorless one that I made, but I really like yours too. Thanks again! You are awesome. Thank you so much for taking the time to get in touch. I’m thrilled to hear that you like the printables. I’m afraid I’m not much help with MS Word, I haven’t used it many years. Have you tried making a table for the calendar boxes? That might help. As for the 2 page per month calendar, the 2016 ones print really well in black and white. That’s how I’ve printed all of mine for my planner because my colour printer is broken. If you go to your printer settings there should be a way to choose greyscale, black and white or (on some printers) use black ink only. That should help save on the colour ink. I’m sorry I couldn’t be more help with the word problem. Any chance you could make a single half size for 2016 like you did for 2015 for monthly calendars? I am looking for 2 months on a page basically. I just discovered your site and these are beautiful. HI Jen I did! I just totally forgot to put them on this page too. Heading over to do that right now, give me about five minutes and they should be good to go. I’m so sorry about this. Perfect!! Thanks for the quick response! Love your stuff! Thank you for the new calendar. I used your 2015 calendar and it worked so perfect for my binder. Simple with great colors this year! Thanks. p.s.- Great job on the calendars and planners Allie, I am as disorganized as it comes and they really help out. My wife and I use them all the time, as well as I use them to help me manage my office. WHAT A LIFE SAVER YOU ARE !!! I never could keep one of those super expensive day runners from getting Kool-Aid, cookies, Ice cream, dog slobber..you know the typical on the run family stuff…off of them. Now we just print as needed for the family to stay on task. Thanks so much for taking the time to leave such a helpful comment Brandon. Printing doublesided when you don’t have a duplexer can be really frustrating at times. Thank you! These are perfect! I am using your pages for the second year in a row, they are the best! Hi this will be my first year using your amazing created calendars, to do list and goal worksheet. I was scrolling through and I did not notice any calendars the have the holidays inserted. Do you have any calendars or will you be doing any in the future that will already have these dates incorporated into the calendar? Thanks for sharing. Are you going to do a Monday start on the half size on two pages for 2016? Hi! Just printed your half size single page calendar pages to go in my Carpe Diem planner to use as a blog post planner. They are perfect. I’ll do an update post on my planner in a few weeks and will link back to your website if that’s ok. It’s amazing that people offer these for free so thank you thank you thank you!! Excellent suggestions ! I was fascinated by the info ! Does anyone know if my business could possibly get access to a fillable a form example to edit ? I have loved using these dated calendar pages!! Are you doing them again for 2017? I was having the same problem. I did not have a “black ink only” option, but found another alternative. I opened the file (after converting it to an image file) with the “photos app” in Windows. There is an option there to “enhance” the photo and this solved my problem for black and white– hope it helps somebody else too! That’s a neat idea,thanks for sharing Jody. Thank you very much ! You are doing an amazing job ! I just started using your printables (the weekly ones) and they are perfect for me ! Thanks Andrea! I’m thrilled to hear that you found some printables that you like. I hope you enjoy them. Thank you so much! I’m looking for 2017 and I’d love them to match your awesome 2016 monthly calendars (full size 2 page/month to be specific)! Any chance they’ll be available for free or for purchase soon? The 2017 calendars are almost all finished. I’ve published the year on a page ones and the full-size ones. Just putting the finishing touches on the half-size ones and they should be ready to be shared tomorrow. And they are free!! Hello. Love the big calendar for our family life planner!! Was hoping 2017 would be up soon! We are in charge of a group at church and need to hand in dates a year ahead of time. Would love to use these again! Hi Alyssa, they are up, I just haven’t had a chance to move them to this page yet. I’ll get right on that, thanks for the reminder. Hi Lan, thanks so much for taking the time leave such a nice comment. At this time I’m not able to created editable PDFs, I just don’t have the software to do it with. I’m really sorry, I know it’s nice to be able to type things in before you print. I’m working on figuring out how to make this happen. You’re very welcome Nan. I hope you find some that will work for you! I love your planner pages and this is my second year using them. Thank you for these, they are awesome! I am so happy to hear that you like them Laura. I love the new 2017 color scheme and look forward to the coming weekly views and any another ones you might do. I can’t thank you enough for all your hard work and the kindness you show by giving these to us for free, when you could be selling on Etsy. I use many of your pages and find them so helpful in getting me to stay on tract. My mom called me this morning (she’s 84) wanting a calendar she could print to hang on the fridge. I had her look up your site and she found these beauties too. Again, thanks for your hard work and generosity. Hi Sonal, thank you so much for your kind words. What sort of study planner are you looking for? Thanks so much! This is exactly what I was looking for. Great format, easy to print and I can insert in my own folder. I’m frugal and just didn’t want to spend a ton on a calendar. I’m so happy to hear that you like them Barbara. I hope they work well for you. To your two-page/monthly calendar (full page, not half-page), simply add a blank page for the first page to the pdf. This will essentially become the cover for the booklet. Then to print from Adobe Reader, select “Booklet” from the print menu and it’ll automatically format it to a half-size booklet. I would have added a blank page myself, but Adobe Reader doesn’t allow you to do so, only Adobe Acrobat. Thanks so much for the suggestion Paula. I’ll see about making that change for the next calendar. I greatly appreciate that you took the time to share that with me. Thanks agaiN! Just discovered your website and its a dream. So glad that someone with brains and style has done this! This will be incredibly helpful! Thanks so much Ladawn. I hope you find a few printables to help you out. Thank you so very much for these free printable pages! you did a great job! Love them! Thanks so much Jaylee. I hope you enjoy using them. I LOVE your calendars, especially the full page 2 page calendar! It’s amazing. Do you have the 2018 calendar yet? It’s May, I know….I’m working on the 2017-2018 school year events. Can’t hurt to ask! Hi Meg, the 2018 calendars are coming out this week. I’ll try to make sure I update this page this weekend to make it easier to find them. Oh my goodness! I LOOOOOVE your 2 months per page calendars Alli!!!!! I hadn’t seen these before and they’re PERFECT!!! Thank you soooo much! You know me with black and white, but I’ll take them all the same for 2017, as I’m sure you’re busy with 2018 already. Thank you, thank you, thank you!!! I’m thrilled to hear that you like the 2 page calendars Kimberly. I hope you find them helpful. The colour 2018 ones are already up on the blog and the black and white ones will be coming to the Secret Printable Library for newsletter subscribers in a few weeks. Will you have a 2018 2-page Daily Calendar available soon? Last year I did the blank one, but I suffer from arthritis and well I rather have it dated than to have to manually set it in. Hi Yolanda, I’ll be updating the weekly and daily printables to match the 2018 calendars soon. I got a little side tracked with our move, but one we get settled into our new place I’ll be able to start sharing those. Look for them to start getting released near the end of November and throughout December. You are very welcome Liz! I hope you enjoy using the calendars. Thank you so much for offering these FREE printables! I use the TUL discbound system; when I first started I bought the calendar inserts, but they are expensive for a family of 5. I moved to printing the calendar template in Microsoft Word, but was unhappy with the format. I printed your two-page calendar and I am in LOVE! Finding your site has been a blessing and you my angel. 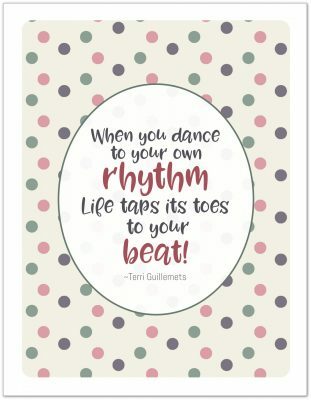 I’m so happy that you are enjoying the printables and finding ones that fit your needs. Thank you so much for your kind words.